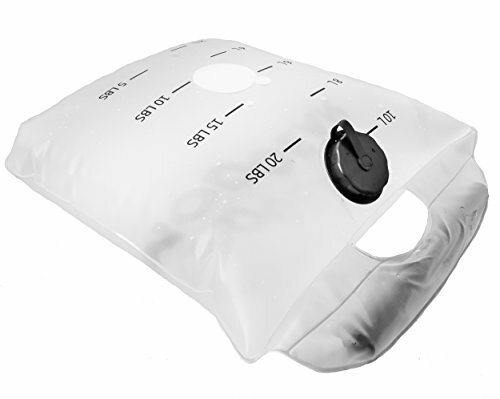 Water Weight by ModGear is made from thick PVC that is heat sealed to avoid leaks unlike other weights with sewn seams. No other additional bags or liners are needed to prevent leaks. The flexible PVC material and round corners ensures the Water Weight won't damage backpack fabrics during workouts or clothing when packed in luggage. Use your own ruck, hiking or backpacking pack that fits your body instead of buying expensive additional backpacks just for conditioning. Add additional Water Weights if you need more than 20 pounds. When empty the Water Weight is only 8 oz and fold down to 10x6x1 inches. It easily fits inside your carry-on or suitcase allowing you to stay in shape when traveling. You can use it for bicep curls in your hotel room or put it in a backpack for your morning jog. The Water Weight can hold up to 20 pounds (9.1 kgs) of water and can easily be adjusted with visible 5-lbs and 2-liter graduations marks. No need to convert liters to pounds or carry a scale into the backcountry. Just fill the Water Weight before your workout and adjust the weight as you go by either dumping out some water or adding water from a nearby source. The wide 1.5 inch mouth allows the weight to be easily filled from a sink, bathtub, stream, or lake. More environmentally friendly than dumping out sand, rice, or leaving steel weights at the top of mountain. Fill with water, collapse sides to reduce air inside the Water Weight then screw close lid tightly, then turn upside down to make sure lid is tight before use. The included handle allows easier handling when using the bag for curls and other exercises, but can be removed to conform to smaller backpacks. Because of the durable flexible PVC material this product should not be used to carry water for cooking or drinking. If you have any questions about this product by ModGear, contact us by completing and submitting the form below. If you are looking for a specif part number, please include it with your message.